Investors often think that because their rental property is older that there is no worthwhile depreciation or allowances that can be claimed. Division 43 allows deductions on capital works on residential properties from 18th July 1985. This generally refers to the ‘shell’ of the building and is usually referred to as ‘Building Write Off’ allowance. Older properties usually have amounts that can be claimed by virtue of any building work done to the property since that time. This could take into account common things like kitchen and bathroom renovations, extensions, reroofing, restumping and the like. The amount claimable is 2.5% on a straight line basis over 40 years. This means that a property built in 1985 is still capable of being claimed up until 2025, and any improvements up to 40 years following the date of those improvements. Other components of the building referred to generally as ‘plant & equipment are claimable as Depreciable items under divisions 40 of the Income Tax Act. These allowable deductions cover numerous items such as floor and window coverings, appliances, hot water units, mechanical fans, electric pumps, removable light shades, fluorescent lights, heating, cooling, security and fire alarms to name but a few. There is no age restriction on construction/ installation date for these items and therefore they can be claimed regardless of the age of the property. Income tax Ruling TR 2014/4 although not exhaustive, provides a good indication as to the items that can be claimed. , we will be happy to give you an obligation free quote or answer any questions about your particular property. 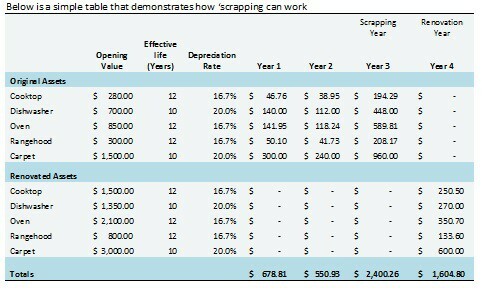 Scrapping is the removal and disposal of any depreciable assets from an investment property. It can be defined as the demolition of any existing structure or fixture onsite that would have been eligible for claiming depreciation deductions. Scrapping of existing structures, fixtures and fittings is an effective method of obtaining deductions within Australia’s tax system. It can provide additional tax deductions for property owners who demolish or dispose of existing buildings or part thereof so long as they were owned as an investment asset and eligible to produce income. If an investor decides on ‘Scrapping’ an item, the amount that is yet to be written off for a particular asset (the residual value) can generally be claimed as a 100% tax deduction at the time of disposal. Abbcon Associates are experienced Quantity Surveyors who specialise in the preparation of Tax Depreciation Schedules for residential/ commercial and industrial investment properties. Property tax allowances are a valuable aspect of any property investment due to their ability to enhance an investor’s return and produce a healthier cash flow, by correctly claiming and maximising the available deductions. Property tax allowances form part of the Income Tax Assessment Act 1997 (ITAA 1997) and provide an opportunity for owners of income producing property to reduce their assessable income. There are a number of property tax allowances available to property owners, investors, and developers, including allowances for building structure and depreciation on plant. Property tax allowances are often simply referred to as tax depreciation. What allowances are available for my residential investment? Capital Allowances (Division 40 ITAA 1997). Capital allowances are available to owners of plant in both new and second-hand properties that produce assessable income. There is no legal definition of plant, however Income Tax Ruling 2014/4 lists over 1,200 assets that may be depreciable including carpets, air conditioning and light fittings. Income producing buildings constructed after 17 July 1985 can be eligible for building allowances, of either 2.5% or 4% p.a. dependent upon construction commencement date. Building allowances are calculated using actual costs of construction or refurbishment, excluding the cost of all plant and non-eligible items e.g. land and soft landscaping. Additional Claims Renovations, extensions, repairs, and write-off of demolished works can provide additional opportunities for the investor to increase the deductions and return on their property. A high level of expertise is required to ensure that investors obtain maximum allowable entitlements. To submit a property tax allowances claim to the Australian Taxation Office (ATO), an investor should request a property tax allowances schedule from a professionally qualified person. Quantity Surveyors are stated as appropriately qualified people in Tax Ruling 97/25 and their schedule will substantiate an investor’s depreciation claim upon lodgement of their tax return with the ATO. How is my claim analysed? Since all properties are different, a standard approach to depreciation cannot be applied. In order to maximise the deductions available for each specific property, and to substantiate the claim to the ATO, Abbcon Associates conducts a detailed examination of all available documents, together with a thorough on-site inspection of the property. The various calculations are then made to determine the appropriate deductions and allowances for the property. When should I obtain a property tax schedule? The best time is usually as soon as possible after settlement. Fees are structured to reflect the building type, volume of reports required (multiple units within one complex may attract a discounted fee) and the depth of analysis required (All fees are tax deductible in the year of payment). Abbcon Associates would be pleased to provide an obligation free quote for your specific property investment. Do I have to purchase a property tax allowances schedule each year? Our property tax allowances schedule includes a summary of the investor’s tax claims for the initial thirty years. However, should any of the property’s specifications change through refurbishment, extension, or demolition during that time, an additional report should be generated to achieve the maximum allowable deductions. When a property is sold, there are potentially capital gains tax (CGT) and balancing adjustment issues which must be addressed. CGT may be payable on the land and buildings. Plant is exempt from CGT. However, when selling plant a balancing adjustment must be calculated. This ensures that total depreciation deductions correspond to the actual loss to the taxpayer.